Facet Interactive empowers their end-clients to make better strategic business and digital strategy decisions, through the power of automated and integrated intelligence. The agency’s focus is to create transformative digital revenue engines for its clients through digital strategy workshops, quantitative market research, and insightful recommendations for tech and marketing roadmaps. Axelerant and Facet have been partnering on client engagements to deliver on Facet’s core philosophy of value-driven development. The two agencies first crossed paths at DrupalCon Austin. And from there and for over a year, Facet successfully delivered Product Owner services as an onshore partner with Axelerant. Once leadership met again in Los Angeles, it became more obvious that there was clear value in teaming up for projects, with Facet acting as Product Owner and leading the discovery for clients, while Axelerant focused on development and implementation. As this relationship developed, Facet called in Axelerant for more collaborative engagements, namely: Legacy.com, Mayfair House, and most recently a large manufacturing client. The basis of this relationship has formed around symbiotic growth—enabling mutual agency success. As a supporting partner, Axelerant can achieve continuous discovery solutions that enhance and extend our capabilities and our network as needed. For Facet, Axelerant continuously handles development back office functions and serves as a highly scalable talent source. Primarily these two functions predominantly characterize our Facet engagements. Axelerant has proven to be a dependable partner for handling long product backlogs as Facet’s Back Office. Our team consistently delivers on long-term projects that require continuous development at an expected velocity. With our handling implementation, Facet can focus on optimizing the client experience—if it’s a white label engagement—driving all strategic, client-facing interactions. And because of this arrangement, Facet is free from extending their in-house team through hiring, unnecessarily pushing up overheads and throwing the big picture out of focus. With Axelerant agency staffing services, Facet is able to keep its sourcing costs far lower and this allows the agency to gain better margins on the projects without compromising on technological excellence or timeliness. Facet’s alternative to this approach is to cobble together a team of freelancers. This drastically adds sourcing overhead and increases project management costs. Beyond this, staffing would have to be frequently pulled from diverse freelancer talent pools considering the scalability and the diverse skillsets currently offered through our agency partnership. With Axelerant, Facet can secure the right staffing solutions in less time and with less financial waste. Since our initial engagement with Facet in 2015, we’ve been continuously involved in several collaborative projects, including both end-client facing and white label development executions. Legacy.com, a Quantcast Top 50, was building a new Node and React platform and needed a powerful content management system to support its robust editorial section. 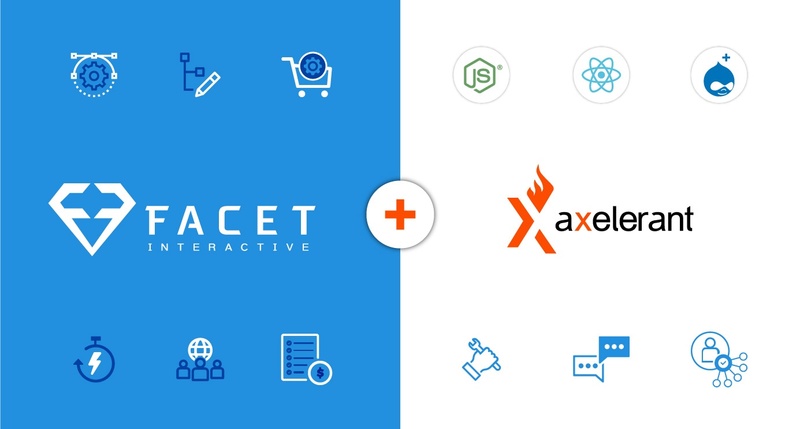 The collaboration between Facet and Axelerant led to Legacy being launched on Drupal, a purpose-built platform offering superior authoring workflow and editorial layout control. Our development team augmented the staff for Facet and Legacy.com to architect, develop, and deliver an enterprise-class headless Drupal platform. This now enables Legacy’s multi-channel publishing across its global network of over 1,400 branded site instances. Being in the same time zone as the client, Facet handled all the client facing activities for the project. This involved mapping the client requirements and translating that into delivery requirements, which took 6 weeks. Axelerant had less than 5 months to deliver the project. The project went live as planned, and Axelerant delivered support for a few months post launch. It was a complex project, as the website has over 2000 newspaper affiliates to whom it serves content through separate landing pages and personalization while having to deliver a unified online experience. Axelerant worked out the solution for this using the RESTful module to ensure full API control and performance. To enable smooth customization of layouts by Legacy’s editorial team, Axelerant developed RESTful Panels, a ctools plugin, that allows revisioning in the RESTful format. The architecture required URL paths which were appropriately optimized for SEO and were easily configurable. For this, Axelerant created a single API resource which routes requests to content-specific resources based on the URL path. Legacy’s team had specific performance requirements for the Drupal back-end. Axelerant provided two layers of caching to deliver this. Mayfair House is a premier retailer, specializing in brand name apparel, accessories, gifts, home goods etc. They had a antiquated platform based on proprietary technology. At the beginning of 2015, many critical bugs involving payment processing and security issues were uncovered in a technical code audit. Mayfair House sought an out-of-the-box platform solution that would grow as its online content and retail strategy matured in the coming years. Axelerant helped Facet execute a Drupal site build and Drupal migration so that Mayfair House could hit the eCommerce runway before the holiday season started—with a technology platform as robust as its portfolio of brands. Drupal Commerce was selected as the solution most capable of maturing into Mayfair’s vision for future features. In the meantime, the base of Commerce Kickstart proved to Mayfair that enough was preconfigured to get started with minimal overhead. The proof-of-concept hinged on the out-of-box viability, and extensibility into one key feature: registries. Mayfair’s burgeoning online business is majorly driven by registries. We improved the commerce_registry project to allow for: tracking multiple quantity purchases at checkout, easy updates to quantity desired, and independent tracking of quality desired vs. quantity purchased. Another of Facet’s clients needed a custom portal for their vendors built quickly. Axelerant built a Drupal website for this and integrated it to their SAP implementation. This was completed within a month. There are times when opportunities like this arise and agencies like Facet have to determine and verify capabilities quickly. With us, it’s a streamlined process that makes saying yes to prospects easier, faster, and much more confidently. With reliable back office support and staffing scalability, Facet can take on and handle big ticket projects beyond initial in-house capacities. Instead of over investing for the short-term in time-consuming and accident-prone talent sourcing methods, they can rely on tailored solutions. This is how we support Facet Interactive's growth: driving costs down while extending capabilities.